I set my bottle of padding varnish (1/2 pound cut of Lemon shellac) up in the window sill over the finishing bench, and did not return to it for many moons. I thought it was pretty cool to see how, left undisturbed, gravity had separated out the fractions of this natural heterogeneous exudate in solution. 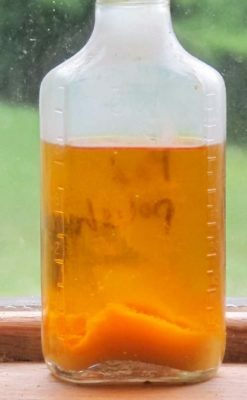 The clarity of the fully solublized wax-free fraction on top is a nice contrast to the partially solublized and suspended wax-containing fractions on the bottom. Shellac: adhesive, varnish, dyestuff, condiment, pharmaceutical ingredient, cosmetic, pyrotechnic binder, and now, entertainment source. Is there anything it cannot do? I guess that one can use the top layer as regular shellac, but is it possible to use the wax for something too? More correctly I guess is to ask if it has had any historic use, perhaps instead of beeswax or carnuba wax?